WOULD YOU REALLY WANT TO LIVE FOREVER? Immortality. What would you do if you had the recipe to live forever? Keep it for yourself, share it with loved ones or tear it up and burn it? The power – for good or evil – would be immeasurable. 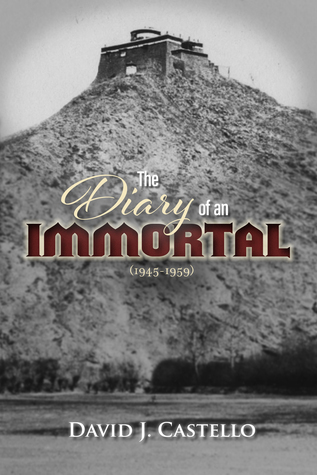 The new magical realism novel, The Diary of an Immortal (1945-1959) by David J. Castello, follows the life of Steven Ronson from 1945 to 1959. A U.S. Army medic, he stumbles across an immortality formula designed for Adolph Hitler during the liberation of the Dachau concentration camp. Still numb with grief and haunted by the loss of nearly every soldier in his unit, Ronson sneaks the formula out of the camp and makes his way to Munich. After a night of passion with a German teenage girl, he consumes the immortality formula as his vendetta against death. Ronson soon discovers the immortality formula also gives him supernatural powers and fantastic musical abilities. He decides to travel to New York City to pursue his childhood dream of becoming a jazz saxophonist, where his performance catches the attention of a disgraced British missionary and his beautiful, adopted niece Jennifer.What follows is a fascinating trail of discovery from New York City to a remote Tibetan monastery where Ronson learns the immortality formula has been closely guarded for thousands of years. Time, however, is running out and Ronson learns German occultists who helped bring Hitler to power in the 1930s have selected another Aryan messiah, and this time he has the formula. Steven cannot allow the nightmare he experienced in Germany to happen again. David J. Castello is the Chief Operating Officer and Editor-in- Chief for the Castello Cities Internet Network (CCIN.com). Born in the Bronx, he now resides in Nashville. Connect with Castello on Facebook The Diary of an Immortal (1945-1959) is available on Amazon, Barnes and Noble and in bookstores everywhere. Next Geek Girls x Bloggers Pop Swap!